The Bab al-Mandab strait is the narrow waterway that separates the Arabian Peninsula from the Horn of Africa and links the Red Sea to the Gulf of Aden and the Indian Ocean. 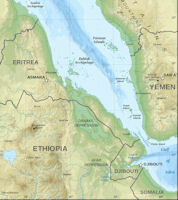 At its narrowest point, the strait is only 29 km wide between Yemen on one side and Djibouti and Eritrea on the other. It is a key strategic channel for commerce and trade, with an estimated 4 percent of global oil supply passing through it. 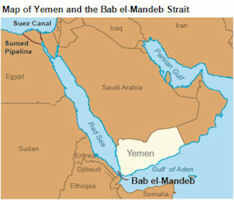 While Yemen is not a major oil-producing country, its coast borders the Bab el-Mandeb Strait, a narrow chokepoint between the Horn of Africa and the Middle East. 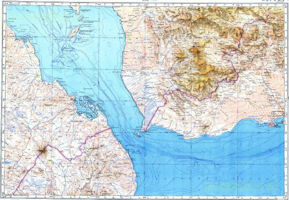 This strait is a strategic route for Persian Gulf oil, natural gas, and petroleum product shipments to Europe and North America, as well as European and North African oil exports to Asia. Although the strait is 18 miles wide at its narrowest point, tankers passing through must use two 2-mile-wide shipping channels. Trade in crude oil and petroleum products transiting the Bab el-Mandeb has increased steadily in recent years, growing from 2.7 million barrels per day (bbl/d) in 2010 to almost 4.7 million bbl/d in 2014. From 2013 to 2014, trade grew by more than 20%, with an increase of more than 200,000 bbl/d in crude oil exports from Iraq to Europe contributing to higher northbound traffic. 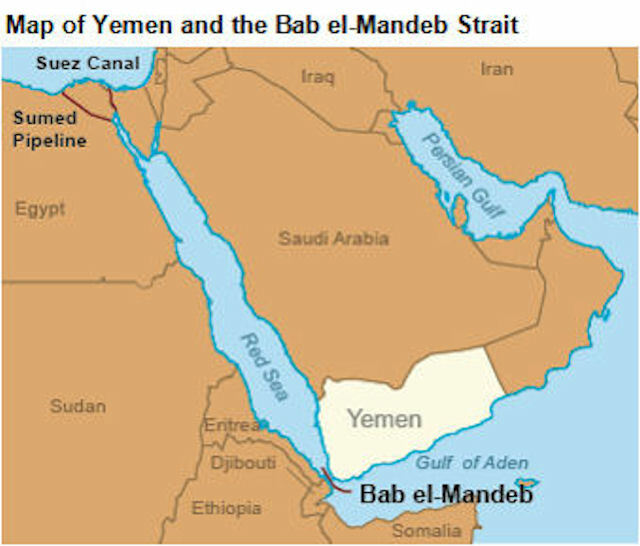 About 30% of Bab el-Mandeb's southbound traffic also passed through the Suez Canal or the Suez-Mediterranean (Sumed) pipeline. While oil trade volume has increased over the past five years through the Bab el-Mandeb, liquefied natural gas (LNG) shipments through the strait have declined. Middle East LNG exporters, especially Qatar, have been steadily exporting more LNG to Asia, while European imports of LNG have declined. More than 2 trillion cubic feet (Tcf) of LNG passed through the strait in 2011, roughly 18% of world LNG trade. By 2014 EIA estimated the volume fell to about 1.2 Tcf, or only 10% of world LNG trade. 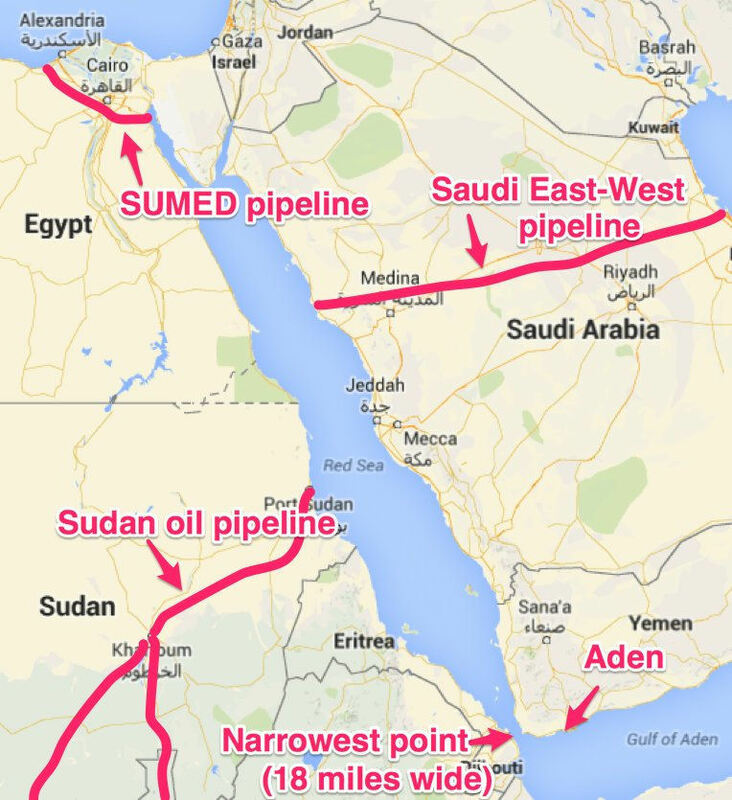 Increased instability around the Bab el-Mandeb could keep tankers in the Persian Gulf from reaching the Suez Canal or the Sumed Pipeline, diverting them around the southern tip of Africa, adding to transit time and cost. 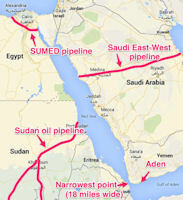 In addition, European and North African southbound oil flows could no longer take the most direct route to Asian markets through the Suez Canal and then on to the Bab el-Mandeb. As the security situation in Yemen has continued to deteriorate, the United States has heightened maritime security in the area, and has announced its intention to work with Gulf Cooperation Council partners to ensure the continued flow of commerce though the strait. 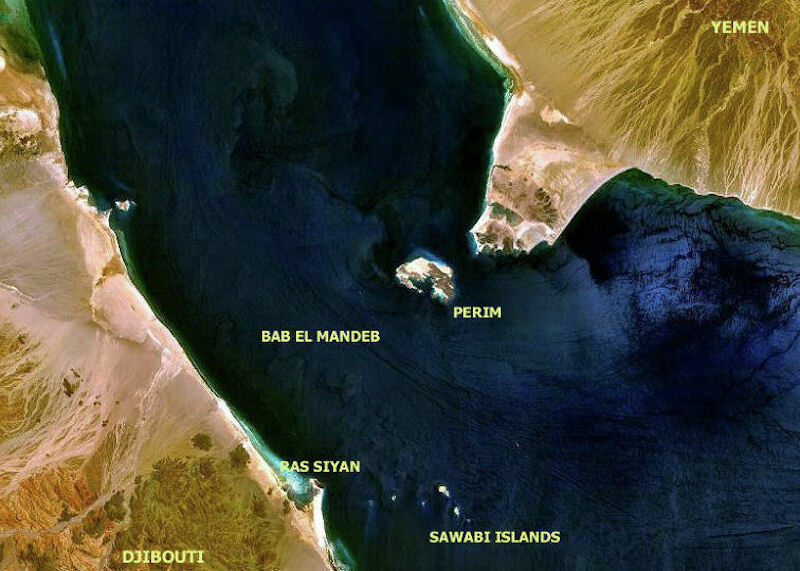 Perim, or Arabic Barim, Island in Bab al-Mandab Strait is at the entrance to the Red Sea, part of Yemen [Variants are Barim Island, Maymun Island, Mayun Island, Mayyun Island, or Meyún Island]. The southern Red Sea and adjacent Afar area represent an enigmatic portion of the Red Sea/Gulf of Aden basin system. 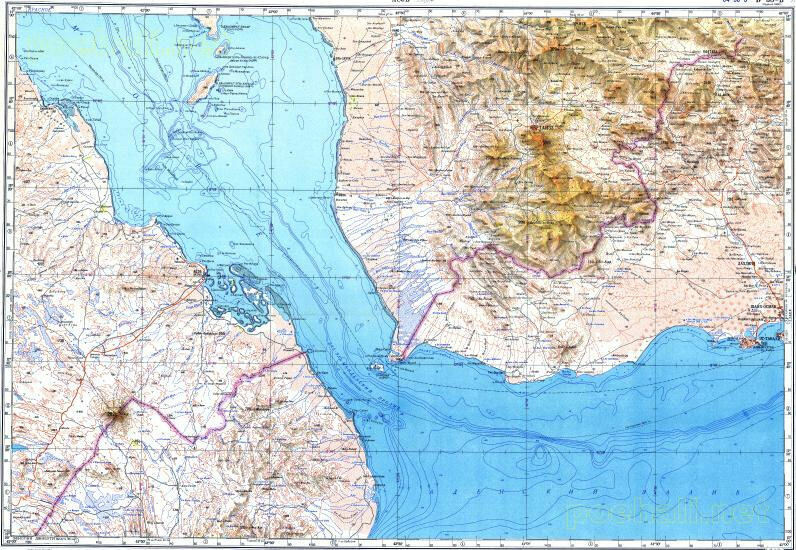 Although the topographic rift shoulders of the Red Sea and Gulf of Aden can be traced through this elbow, and appear to suggest that a similar width for the zone of extension is maintained across the region, the character of the floor of the rift zone changes. 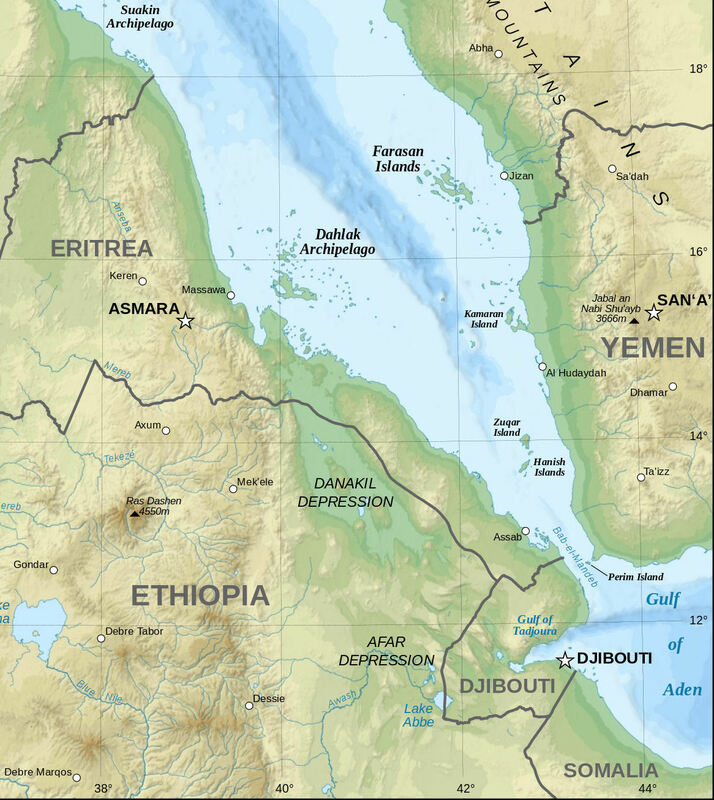 The distinctive character of the southern Red Sea-Afar area results in part from a topographically elevated region, possibly associated with the Red Sea-Gulf of Aden-East African rift triple junction. In addition, however, seismic data from offshore Ethiopia suggests that the distinctive character is due a complex pattern of rifting. 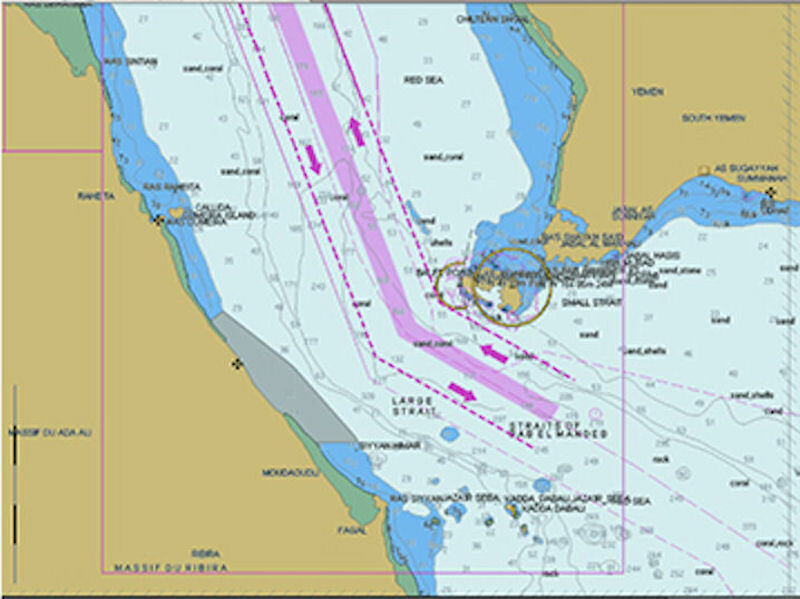 The central axial trough of the Red Sea decreases in depth to the south toward the strait of Bab al Mandab, suggesting that rifting is dying out southward. Farther to the west at the same latitude, a major but narrow half-graben can be seen on seismic in the Gulf of Zula, bounded to the east by a large west-dipping normal fault. This structure continues south into the Danakil Depression of the Afar area.